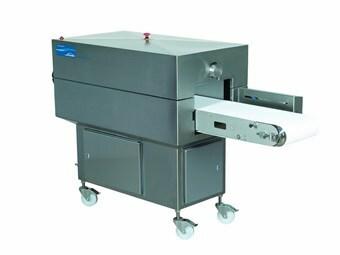 Industrial solutions company BOC recently unveiled an innovative high-speed non-destructive leak detection technology specifically designed for the packaged goods industry. BOC's new Mapax LD leak detection technology uses hydrogen gas to detect faulty packaged goods and allows for the quick removal of the indisivudal defetive item instead of the entire batch. The Mapax Leak Detection (LD) technology was officially launched into the Australasian market at the Auspack expo in Melbourne late last month. According to BOC food and beverage bulk gases market manager Jon Hawton, the Mapax LD uses hydrogen as the detection gas and detects faulty packages which can be removed from the production chain quickly and easily with minimal interruption to the process flow. "This globally patented technology uniquely allows 100 per cent of packages to be tested in a non-destructive manner which can prolong shelf life. This is particularly important in the food industry," he says. "Previously production pauses and visual or water testing could only test the integrity of random samples of packages." Packaging failure and leakage often occurs when food packages are not all hermitically sealed. This can be due to poor sealing or physical damage such as pinholes or when products gets caught in the seal which can lead to loss of shelf life, damaged products or poor appearance. BOC says the Mapax LD is used on modified atmosphere production lines for a wide range of packaged goods to test for defective products and allow the individual items to be removed. This saves the packaging company from having to sacrifice the entire batch of product, hence minimising financial loss and environmental impact. "If only random checks are applied, this means that when a leak is found, the whole batch produced since the last checks either has to be repackaged, disposed of or even recalled," Hawton says. "Mapax LD can help companies reduce these inefficiencies and keep production costs down." BOC's Mapax LD system is now available in Australia and New Zealand. Find out more on BOC Australia's website. Find packaging equipment for sale.